Hot Topics: Kate Winslet Cudo: Check out today's deal! Karl Stefanovic began co-hosting TODAY in January 2005. Karl graduated from Queensland University of Technology with a degree in journalism in 1994 and began working for WIN-TV in Rockhampton and Cairns as a cadet reporter. A year and a half later, he took up a position with Television New Zealand in Auckland as a reporter for One Network News, presenting the news and other programs. 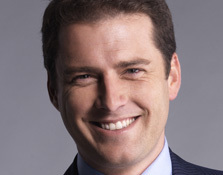 In 1998, Stefanovic accepted a reporting and reading job for Ten News in Brisbane and then became the fill-in newsreader for Ron Wilson in Sydney. In 2000, he moved to Channel Nine as a reporter and back-up presenter with National Nine News. He received a Queensland Media Award for Best News Coverage for his report on the Childers backpacker hostel fire. Stefanovic's exclusive reports on the New South Wales bushfires from Sussex Inlet in January 2002 led to his appointment to Nine's Sydney newsroom. He was involved in Nine's coverage of the Canberra bushfires where 400 homes and numerous lives were lost in January 2003. He was also part of the Bali bombing reporting team and went on to cover the arrest and trials of the main suspects as well as the bombing of the Marriott Hotel in Jakarta. In 2003, he was posted to Los Angeles as one of the Nine Network's US correspondents.